Aaron isn’t the only computer with artistic pretensions. 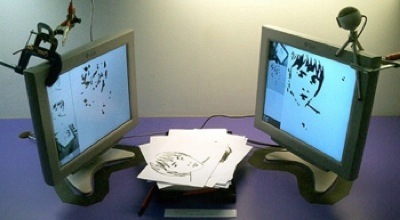 In a unique experiment at the Institute of Contemporary Arts in London in 2005 two digital artists, Ed Burton and Zach Leiberman, created the ultimate cyber head-to-head. In Ed v Zach two computers were programmed to observe each other’s screen and take it in turns to draw the other’s output. One computer ran a program called 'Ed' by Ed Burton and the other a program called 'Zach' written by Zach Leiberman. Placing your hand on one screen, for example, would make the other computer try to draw this shape. Over a period of days the two computer programs drew each other endlessly, creating a slow and beautiful feedback process and generating wonderful interactive art. Even robots can draw inspiration from each other!